bread upma recipe | south indian bread upma recipe with detailed photo and video recipe. 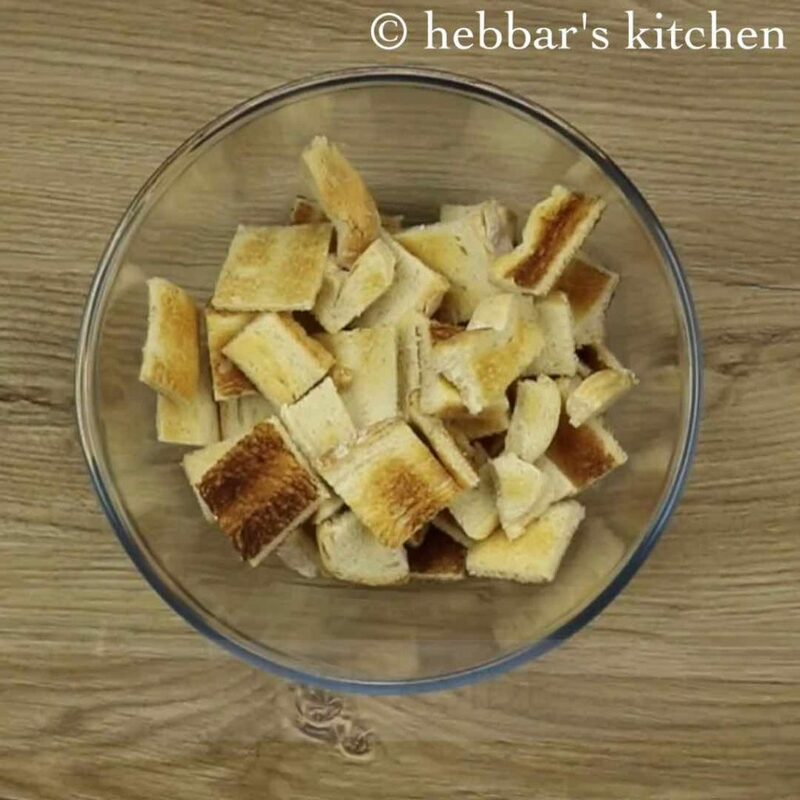 a simple, easy and tasty snack recipe which can also be served as a breakfast recipe. 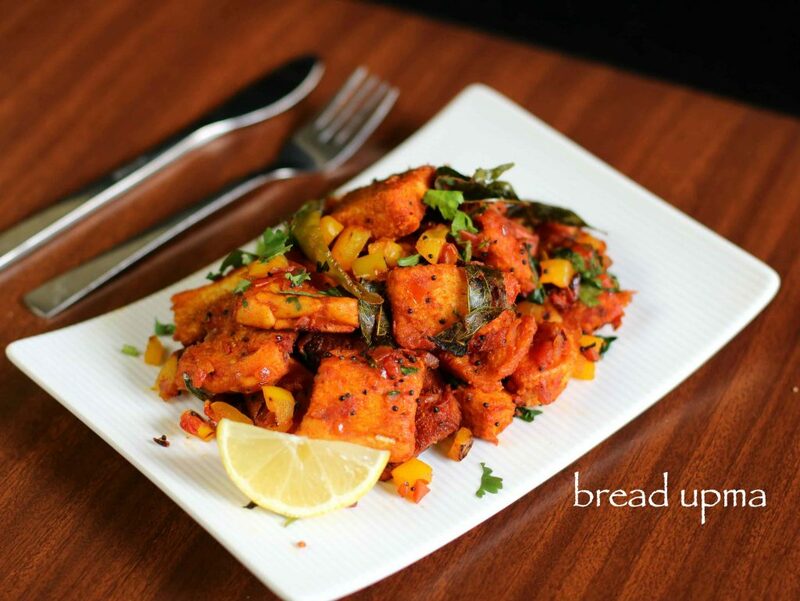 basically bread masala upma is prepared from left over bread which involves toasting of bread and then frying it with other spices and vegetables. bread upma recipe | south indian bread upma recipe with step by step photo and video recipe. 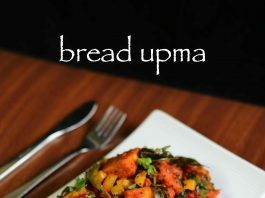 this simple unconventional south indian upma recipe is prepared from left over sandwich breads which can be optionally served with tomato ketchup. this quick upma can be a instant hit in your next kitty party and certainly loved by kids and even with adults. i had actually bought these sandwich breads so that i can prepare veg sandwich or bombay sandwich. however, for some reason, i was occupied with other recipes and i forgot to cook those. meanwhile, the bread slices were about to expire and i had to finish them quickly. i was running out of recipes, and i asked my husband who suggested me bread masala. but i had already shared this recipe, hence i wanted something new. fortunately i got this idea to prepare bread upma for my breakfast as a bachelors recipe and somehow i managed to finish it. 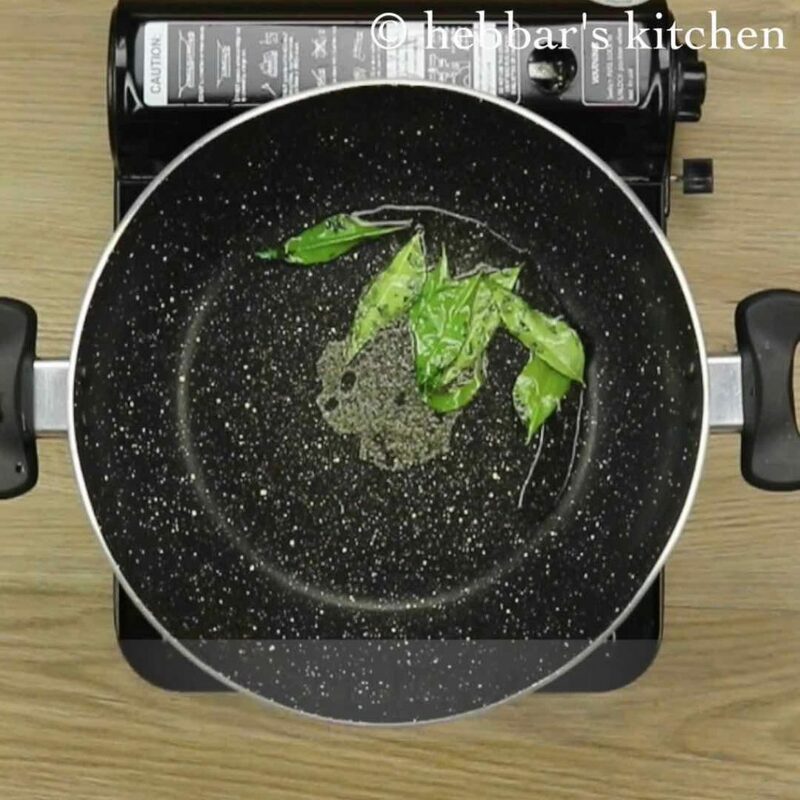 while the preparation is extremely simple, some important steps for a perfect bread upma recipe. firstly, i would heavily recommend to toast the bread first and then fry them with spices and veggies. otherwise, the bread slices may turn soggy and spongy. 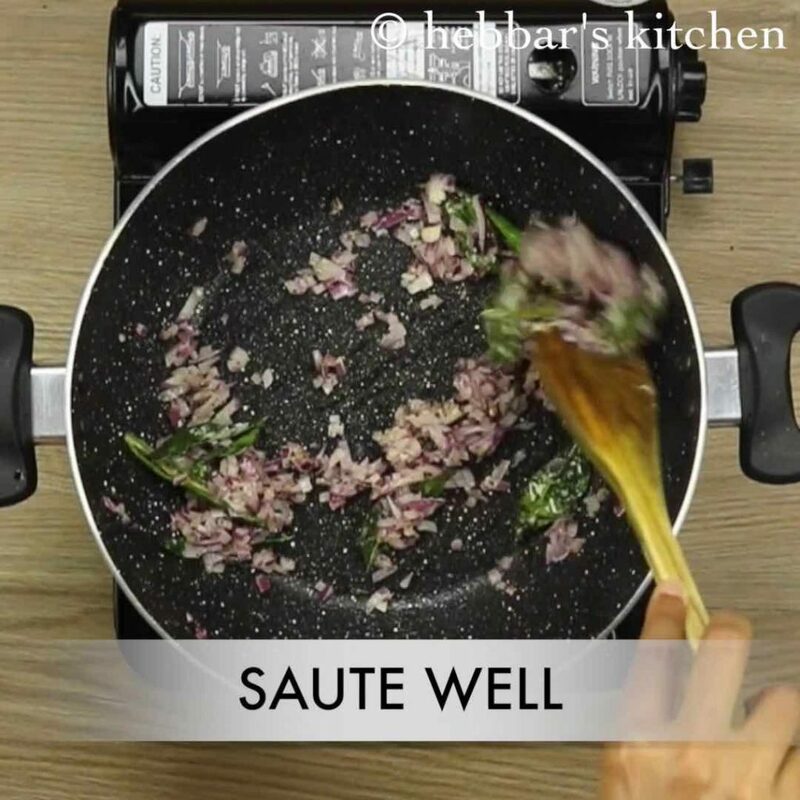 secondly, the recipe can be improvised further by adding veggies like green peas, beans and even broccoli. 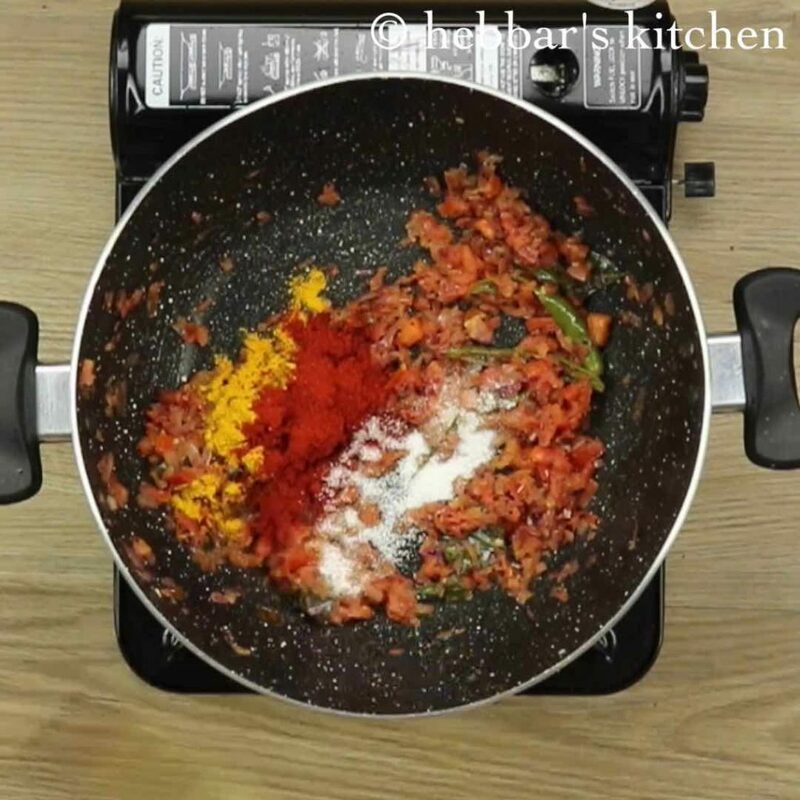 lastly, as an alternative, add maggie hot and sweet tomato sauce instead of tomatoes to make it more spicy and sweet bread upma. firstly, in a toaster or tawa toast the bread to golden brown and crisp. 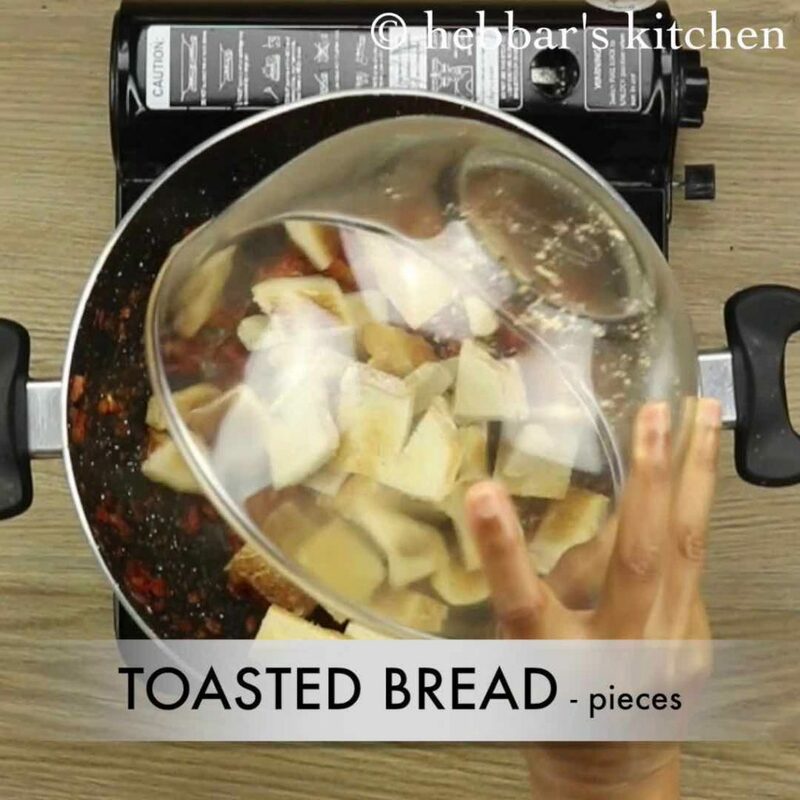 further, cut the bread slices into cubes and keep aside. 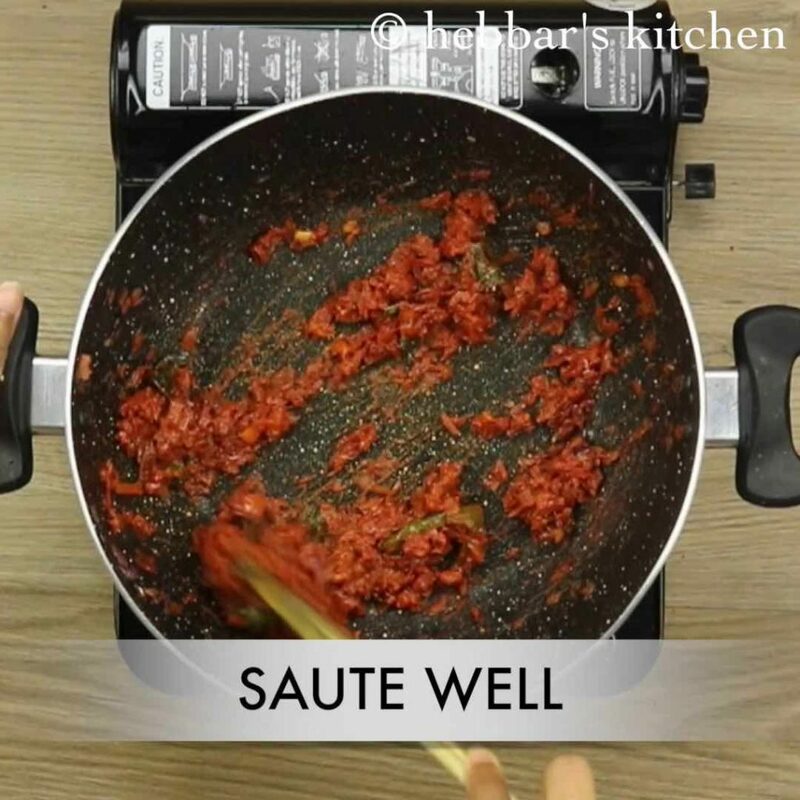 in a large kadai heat oil. further add mustard seeds and curry leaves. saute till the mustard seeds to splutter. 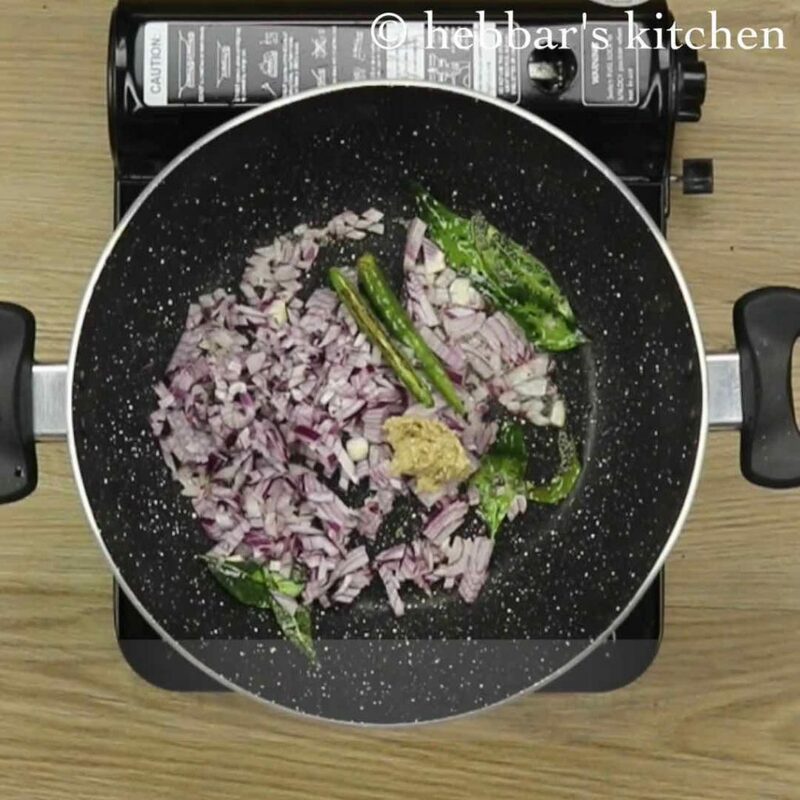 furthermore, add onions, ginger paste and green chilli. saute till onions sweat and turn translucent. now add tomatoes and saute well. 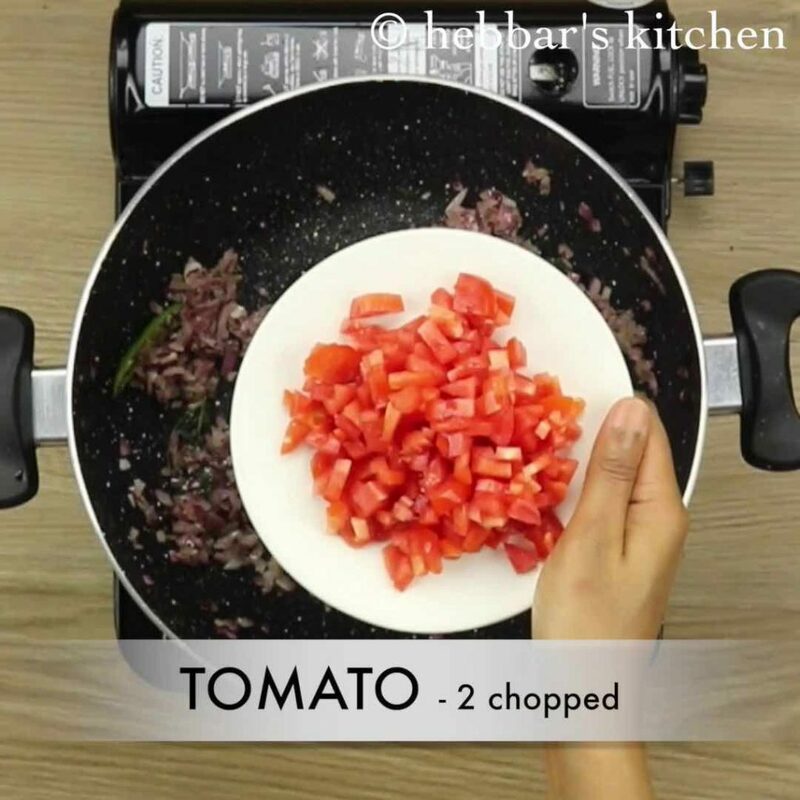 saute till the tomatoes turn soft and mushy. add turmeric, chili powder, sugar and salt. 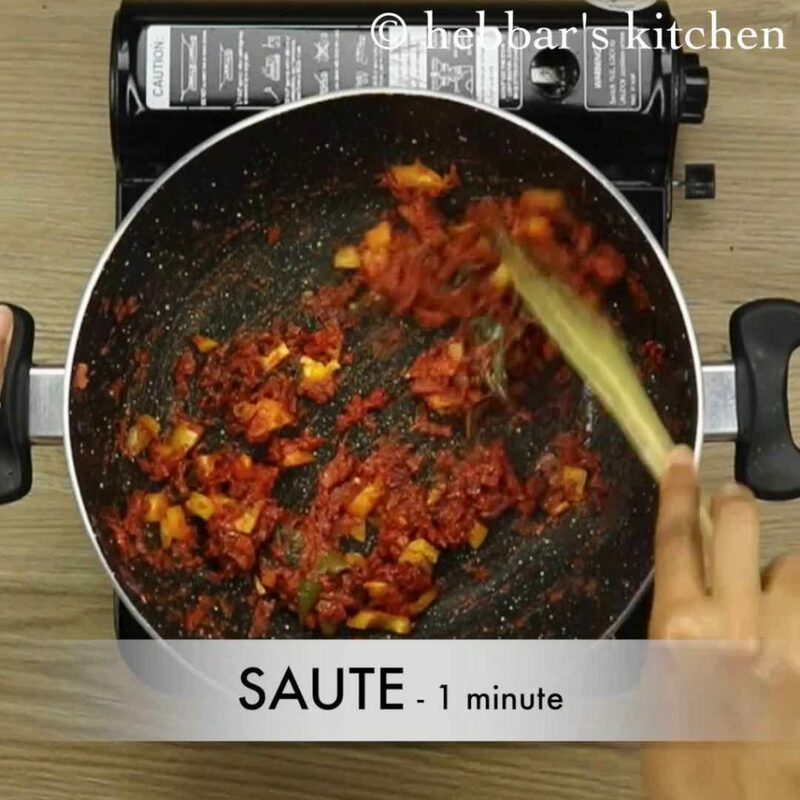 saute for a minute on low flame till the spices are cooked well. 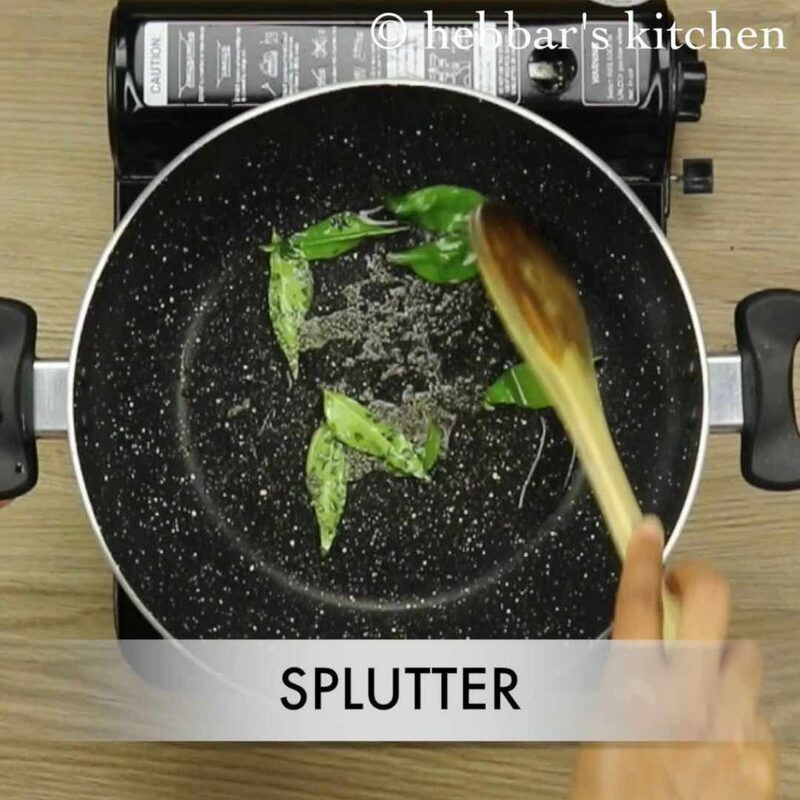 now add capsicum and continue to saute. 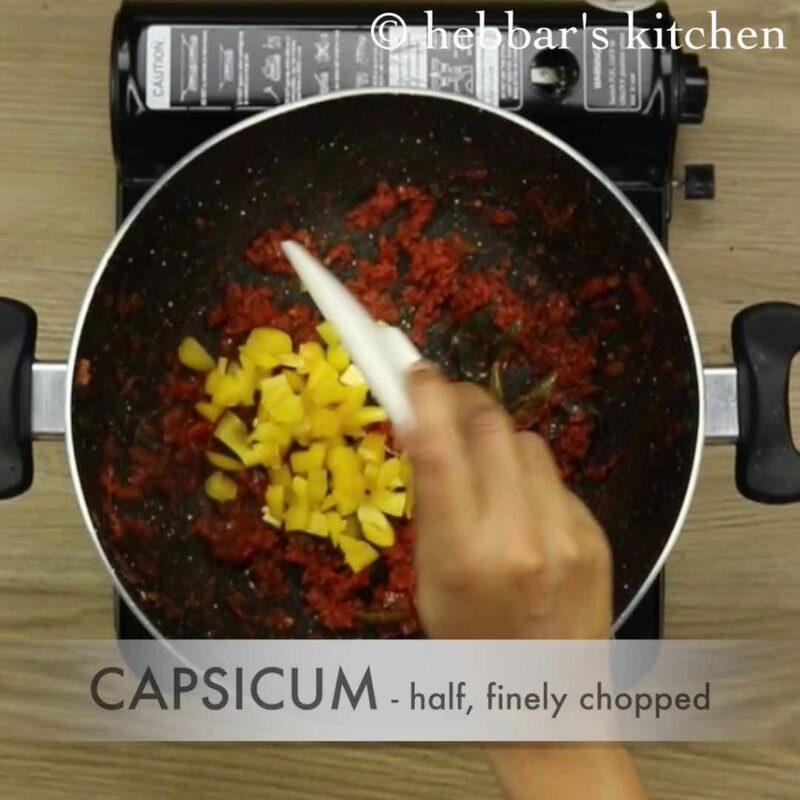 do not over cook and make sure to retain the crunchiness of capsicum. 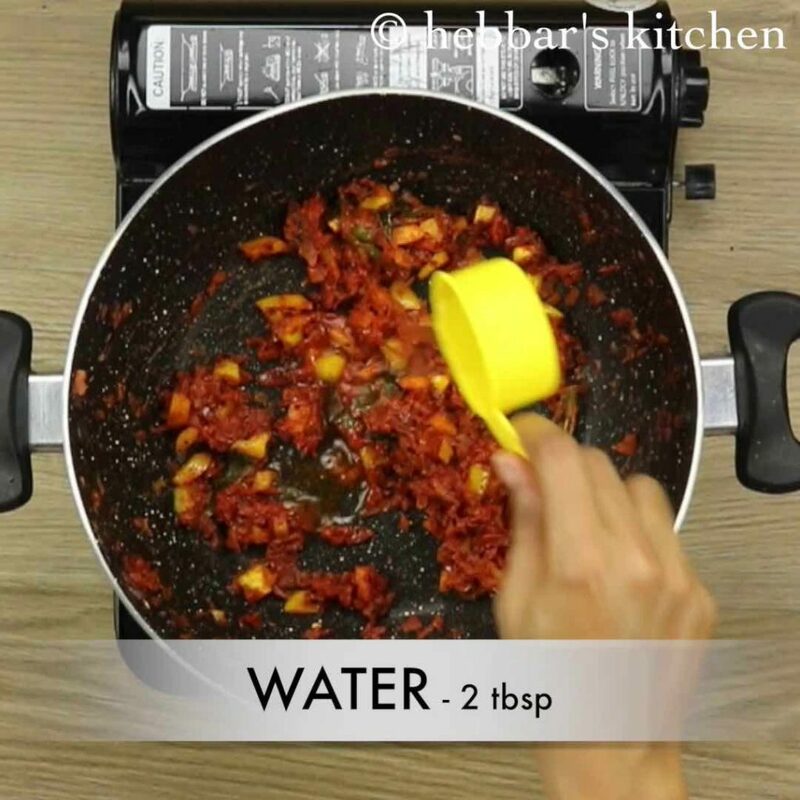 add 2 tbsp of water and mix the mixture well. 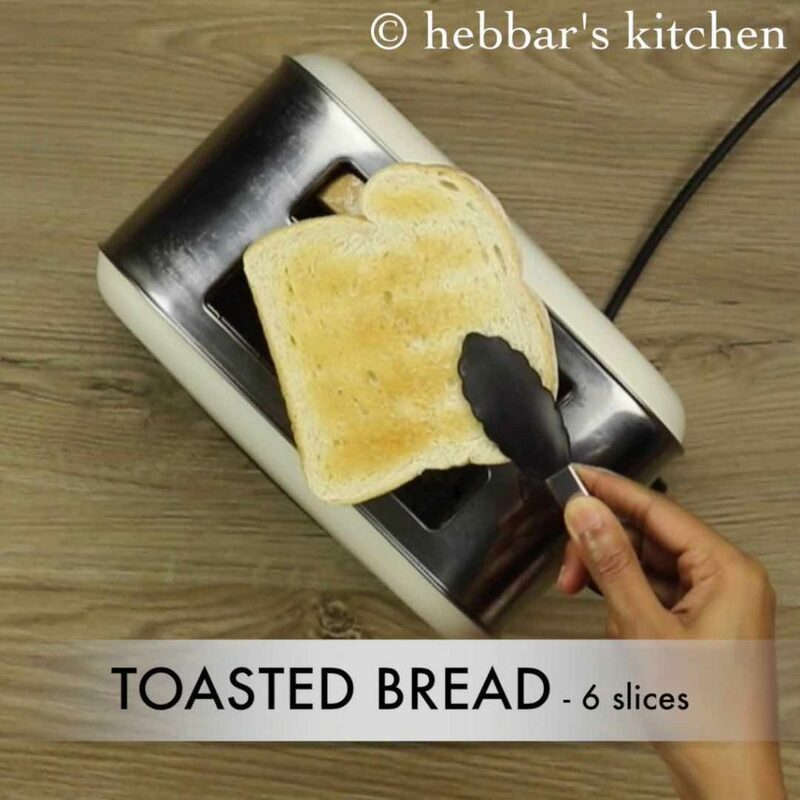 further add toasted bread pieces. 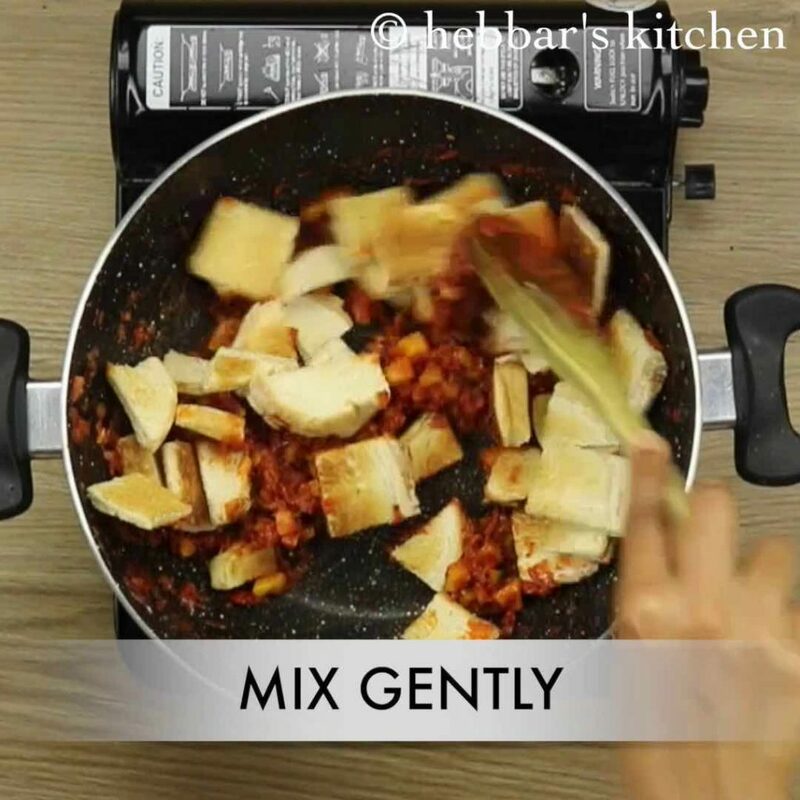 and mix gently without breaking the bread pieces. 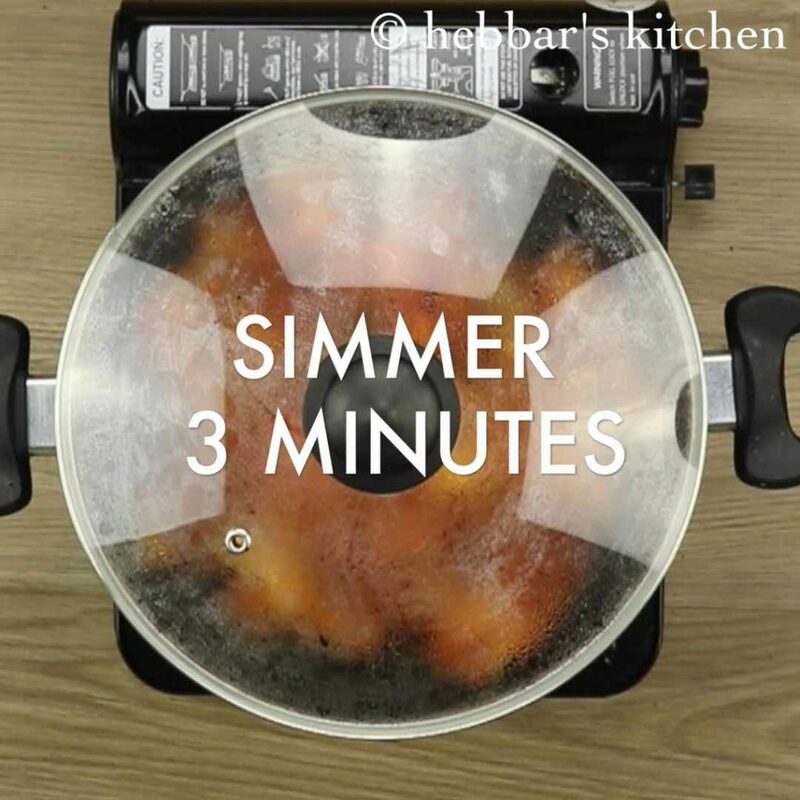 also cover and simmer for 2-3 minutes, making sure the bread absorbs masala. finally, serve bread upma garnished with coriander leaves and lemon wedges. 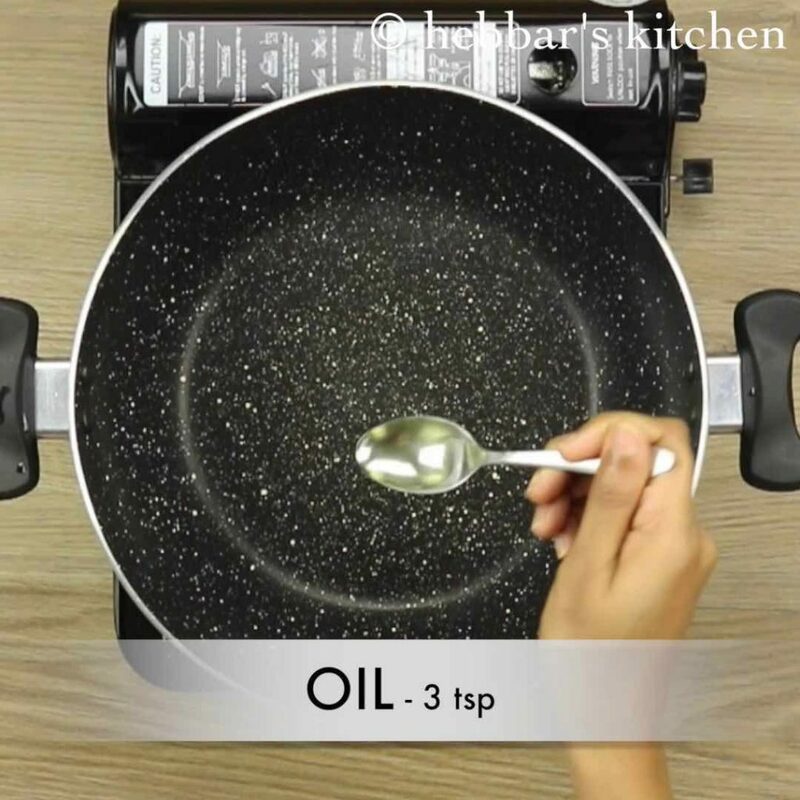 now in a large kadai heat oil. 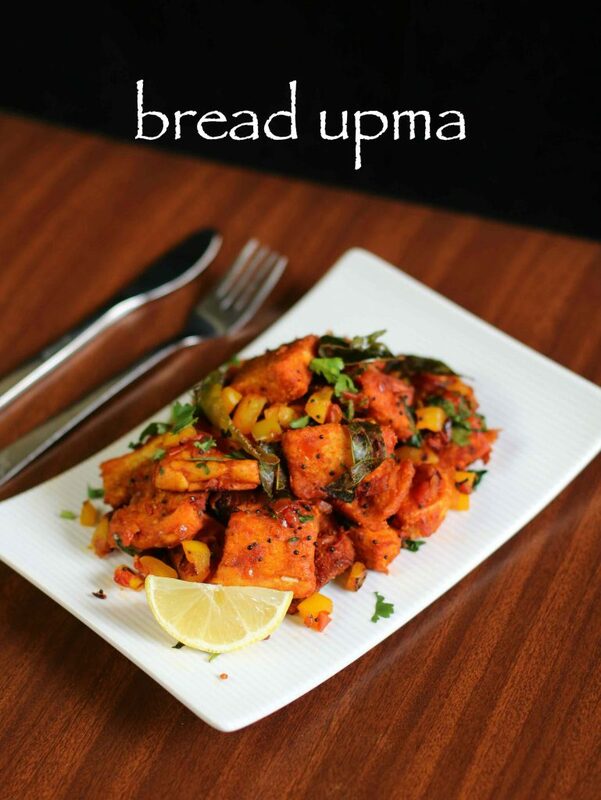 firstly, use butter or ghee for more rich flavour in bread masala upma recipe. also add vegetables like peas, beans and carrot to make it more nutritious. 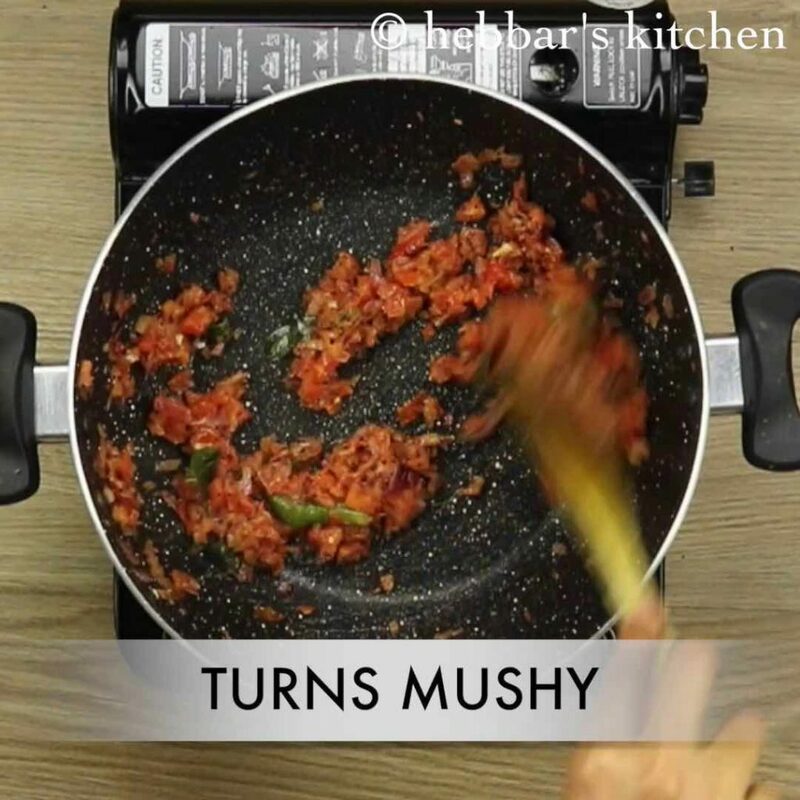 alternatively, you can add sambar powder or pav bhaji masala for more flavours. additionally, toasting bread is optional. however, they add crispiness to bread upma. Wonderful snack.. My 4yr old nephew loved it!! That’s great dish. i have not tried yet. i don’t have toaster. if i roast it on tava the bread gets softer due to residual oil in it. so what to do. i check for new impressive recipe every day in this site. Do you mind if i ask you to put ade dosa recipe. Please confirm if fermentation is required or we can go straight. i hear both. but i am not sure which is correct. hello ravi, roast or toast the bread in tawa without oil. it should remain crisp. i will try to post the ade dosa soon. Hello Hiten, mera hindi itna achha nahi hai. But mai zaroor koshish karonga isko hindi mai likhne ke liye.